There is something very warm and inviting when your hostess places a plate of steaming hot, freshly made biscuits in front of you. In the South, this is a tradition that is passed down through families. Not so much here in Chicago. But it should be! The beauty of this cookbook is it not only gives you a wide variety of biscuit recipes to make, but also shares how to present them. For example, have you considered using a biscuit as a “roll” for a sandwich? Or using the batter to make doughnuts? Or how about using it to make Mardi Gras King Cake? You can even find recipes for Peach Raspberry Scones in Jackie Garvin’s book. And to top off your biscuits, you will find recipes for peach compound butter, chocolate gravy and even muscadine jelly. For me though, this book gave me the perfect opportunity to have guests over for brunch. Truth be told, in the morning, it’s the buttery biscuits that I enjoy the most. I like using really good quality butters when I am baking. Butters such as Plugra, Kerrygold, President, Land O’Lakes and Cabot are just a few examples. Biscuits can be filled with savory ingredients like herbs, garlic or cheese or sweet ingredients like sugars, vanilla or cinnamon. For me, some delicious fresh fruit jams, butter, warm biscuits and hot coffee make me a happy girl. Hopefully, my guests will be as well! 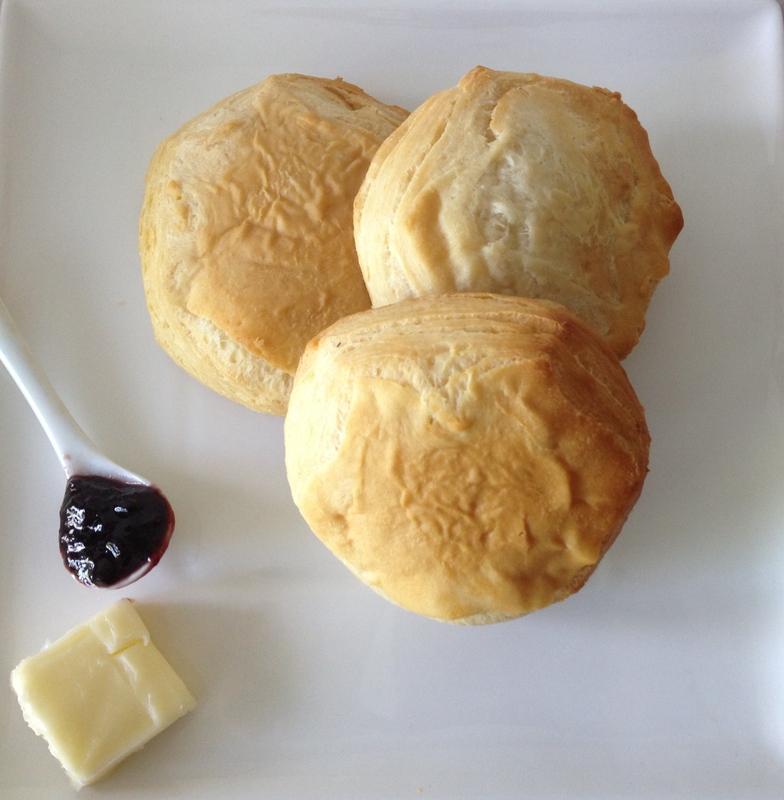 I chose to make a simple Buttermilk Biscuit as my first exploration into this book. You will fid the recipe below. What I particularly like about this book is the ease of use in making these biscuits. Baking can be intimidating to some. But really, if you follow Jackie Garvin’s recipe instructions, you will be very happy with the outcome of each recipe. If you are looking for a new cookbook, this is really one you should add to your collection. You will find yourself reaching for it on all occasions. Happy Baking! Thanks for stopping by! Very detailed instructions are offered in the cookbook along with photos showing the steps to take. Normally I would provide all the steps needed to make a recipe I share here. But, Jackie Garvin does a superb job showing how to make the biscuits so they turn out perfectly each time.